With the novelty from Booming Games – Valley of Pharaohs you can make a trip to the abode of the pharaohs. 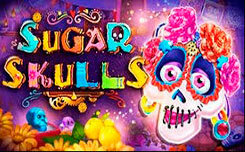 In this game you will meet a lot of characters of the Egyptian theme, which can bring you big winnings. Valley of Pharaohs is a slot with 5 reels, 3 rows, 10 winning lines. You will meet Anubis, the eye of Ra, various pharaohs and their queens. All these symbols have different values, and to receive payment you must collect at least 3 identical symbols per line. Also in the game there is a Wild symbol, this is a girl with the letter ‘W’ at the bottom. It replaces all other symbols except Scatter. 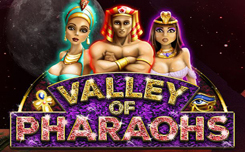 The Valley of Pharaohs offers players free spins. In order to activate them and get 10 free spins, you need to catch 3 Scatter symbols. Throughout the function, you will have a special expanding symbol. For those who like to risk the game, there is a doubling win feature, where you can either double your prize or lose it. You will be asked to guess the color of the card. If you make the right choice, then double your payout, and if you make a mistake, you will return to the main game with nothing.